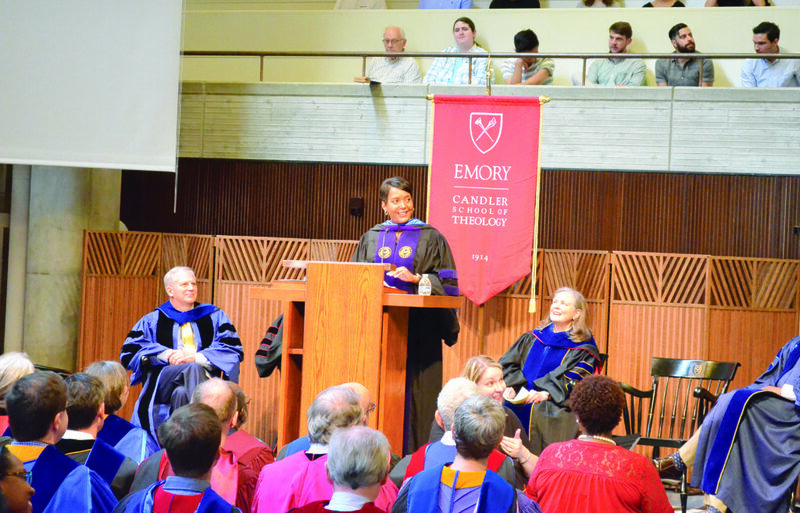 Atlanta Mayor Keisha Lance Bottoms discussed her religious experiences in connection with her political career at an Aug. 30 convocation address to the Candler School of Theology in Cannon Chapel. Bottoms told about 400 audience members that she began to trust in her faith as a child after she realized good people can make bad decisions. Bottoms said seeing her father arrested impacted her childhood. She spent her weekends visiting him in prison. Bottoms’ mother, who previously stayed at home, supported the family when Bottoms’ father was imprisoned. The mayor said the hardship her family endured was a sign from God. The next year, a city councilmember retired, providing Bottoms with an opportunity to enter politics. The decision to run for mayor, however, was more difficult for Bottoms. She said she received support from friends and family, but she wanted affirmation from God. Bottoms narrowly defeated her opponent, Mary Norwood (74C), by less than 800 votes. The mayor ended her speech by encouraging audience members to pray for the city of Atlanta and its leaders. Carmen Reid (21T), who attended the convocation, said Bottoms’ speech reaffirmed her confidence in attending the Candler School of Theology. Sekou Laidlow (21T), another attendee, said she was similarly inspired by Bottoms’ speech.